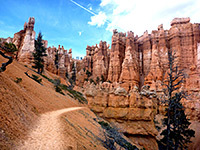 UTAH contains one of the greatest concentrations of spectacular geological features in the world, found mainly in the south and east of the state where the land is largely bare rock of many amazing shapes and colors. For hundreds of miles, the landscape is dominated by twisting canyons, delicate arches, sheer mountains and ridges, spires and buttes. More than any other Southwest state, Utah provides the archetypal Western images of sandy desert, deep canyons and towering red rocks. Southwest Utah is the Color Country; terrain ranges from hot, relatively low areas around Cedar City to forested mountains of the Dixie National Forest, over 10,000 feet high, and is characterised by the many shades of color and beautiful forms of the exposed rocks. Here are found the world-famous Bryce Canyon and Zion national parks, and the less well known but equally pretty Cedar Breaks National Monument, but there are many other variegated cliffs, canyons, domes and sand dunes that also deserve exploration. The southeast of Utah is Canyon Country; the rocks also have a great variety of formations and colors, although they are more generally reddish, dominated by the Wingate, Kayenta and Navajo sandstone formations. 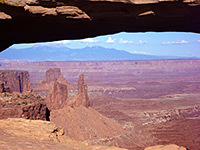 The most dramatic features are canyons, large and small, but there are many other erosional formations such as rock arches found in the Arches, Capitol Reef and Natural Bridges parks. Most of the spectacular and unusual scenery is concentrated around the Green, San Juan and Colorado rivers and their tributaries, which have been steadily eroding the surrounding rock layers for millions of years. This area is part of the Colorado Plateau, an huge uplifted oval of land centred around the junction of Utah, Arizona, New Mexico and Colorado. The landscape has been altered much more recently by the construction of Glen Canyon Dam across the Colorado river - this flooded a large area of desert, obliterating the scenic but little-known Glen Canyon and creating Lake Powell which has become one of the Southwest's major attractions. 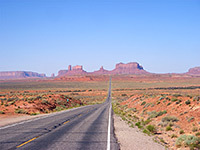 Most of the south and central parts of Utah are protected in national or state parks, wilderness areas and National Forests; there are few towns or roads, and much of the country is still quite inaccessible. There are only three bridges across the Colorado river in Utah, over a distance of some 200 miles. The climate is dry for much of the year and hot - summer temperatures often exceed 110 °F in many places - which has restricted human settlement and left the landscape largely unaffected by man. 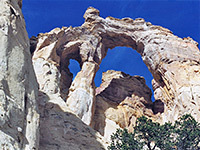 The protection of the region has continued with the 1996 establishment of Grand Staircase-Escalante National Monument, the largest in the Southwest. To the north, the land becomes more mountainous - there are several major ranges including the Wasatch near Salt Lake City, and the Uinta, which has six major peaks over 13,000 feet. The far west of the state is largely barren, part of the Great Basin Desert - a landscape of long flat valleys separated by narrow mountain ridges - which stretches right across Nevada into southeast California. The Great Salt Lake dominates the northwest, and is surrounded by a hundred miles of completely flat salt plains, remnants of an even larger lake. A lot of this land is used by the military for missile testing and closed to the public. From the stark landscape in the northwest to the dramatic forms of Monument Valley in the southeast, the variety of natural landscapes in Utah is almost endless. Parts of some of the popular national parks can become very crowded, but it is easy to find solitude and tranquility in beautiful surroundings across many areas of the state.